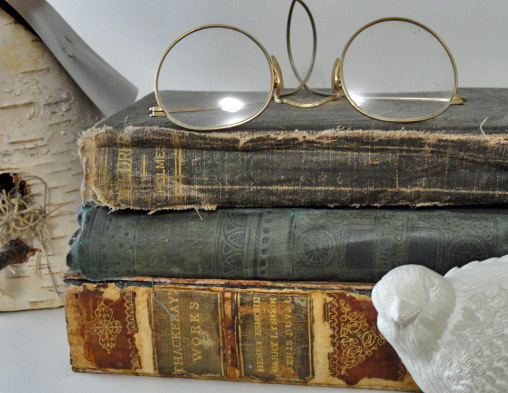 Do you like to collect all things vintage but then wonder what exactly to do with them? 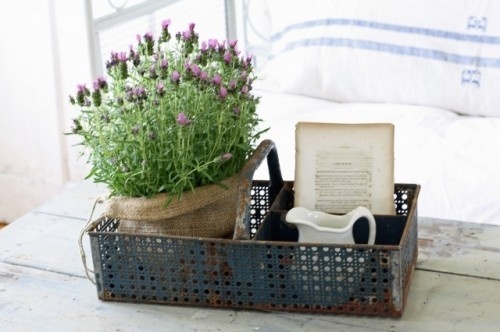 Incorporating your finds into your home decor is a great way to display these treasures for you and others to enjoy. To get the most out of your vintage decorating, you may want to find ways to also re-use the item in a new way that is functional as well as decorative. 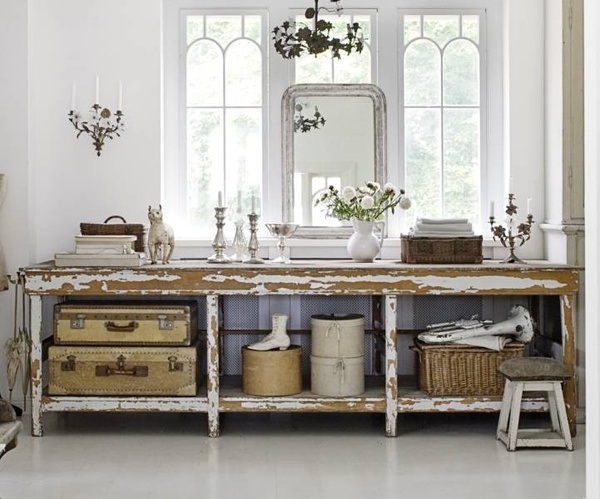 These vintage decor ideas will provide inspiration. I turned this vintage heat register into a useful clip board in my office. It makes a fun way to display the register, which came from my husband’s grandparent’s old farmhouse, that I otherwise may have kept in a box. 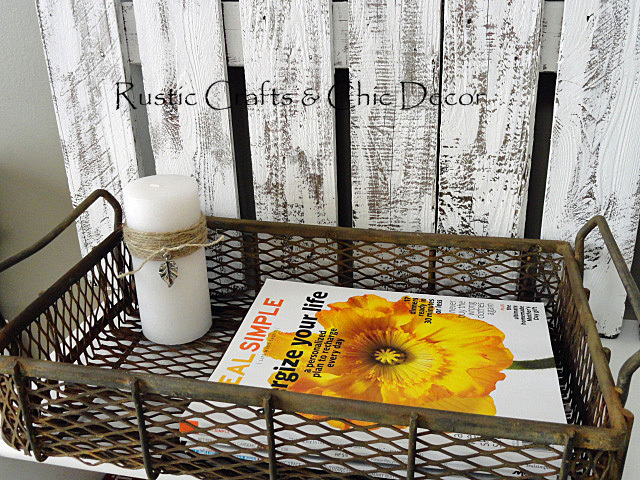 Vintage card catalogs turned into storage by Dishfunctional Designs. I would love to have a storage unit like this one in my craft room! 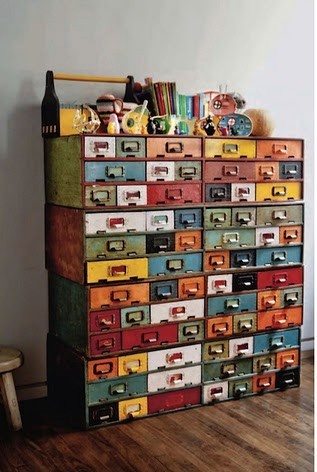 Card catalogs are perfect to re-use as furniture storage with all of the labeled drawers. 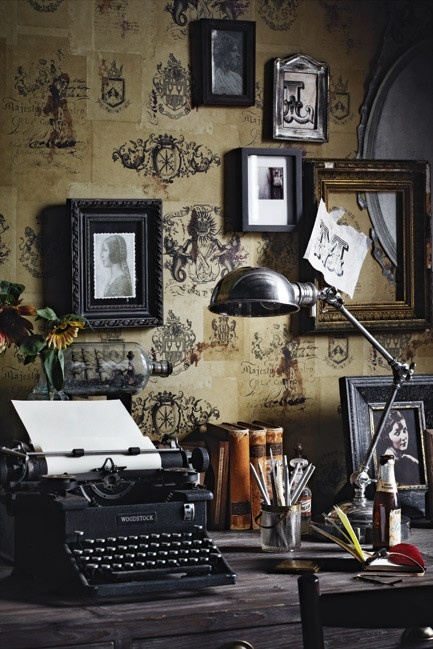 A vintage office by Rustic Meets Vintage. 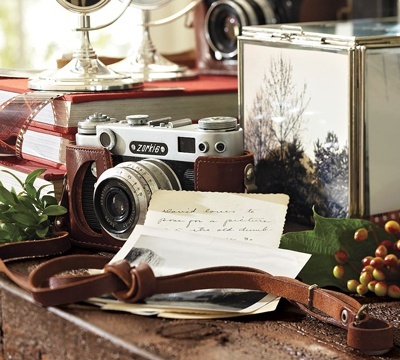 If you want a cozy office, the best way to get that is to mix in some vintage items to your decor. I am quite partial to old typewriters myself but just sold the two I had collected. So….it is time to start shopping again! You can see how I incorporated several vintage pieces, including a typewriter, into my home office from my post on my vintage desk set. Vintage storage table by Chic Antique Chicago. On its own this table might not look like too much. However, when accompanied with all of the other neutral antiques, it makes quite a statement! Not only is it very decorative but is serves well for storage too. Shabby chic cabinet and sign by Home Interior Design. 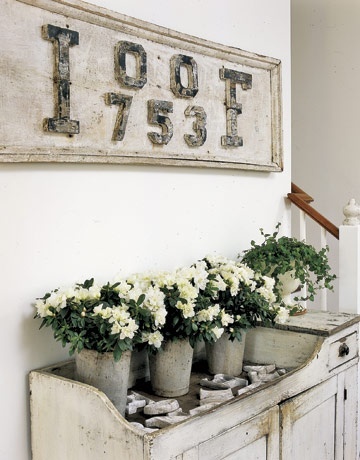 The combination of the white vintage cabinet and sign creates a beautiful base for shabby chic decor. The added flowers soften the look and add some chic as well as the primarily all white color scheme. Vintage industrial basket in home decor by French Provincial Decor. A wall of vintage books by Design Caller. 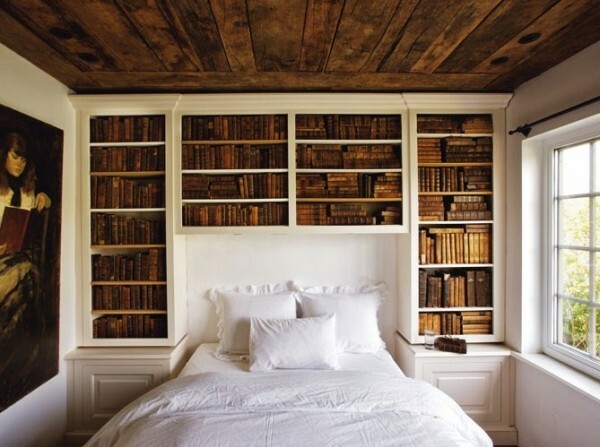 If you are fortunate enough to have a large collection of vintage books, then this idea is perfect for a rustic wall. I love how the warm colors of the book bindings match the wood ceiling in this example. Framing vintage keys by Mamie Jane’s. 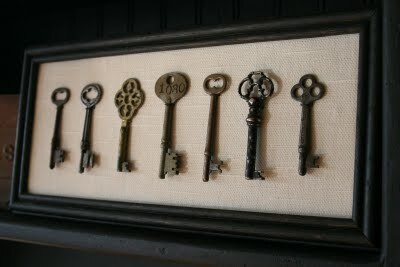 I have seen lots of prints that you can buy of vintage keys so why not frame some actual keys? This is a great way to display your collection and create some unique wall art. 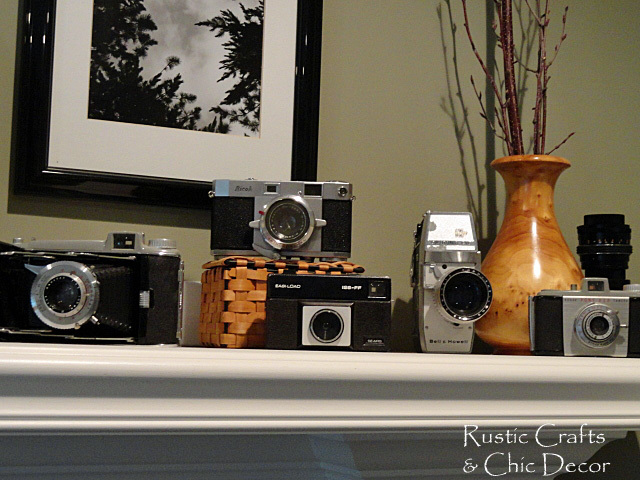 I was thinking about vintage cameras and thought I better go snap a picture of a section of the mantel in our study. We have a whole collection lining the mantel which goes well with many of the black and white photos we have hung in the room. Vintage camera in a grouping by Nibs Blog. 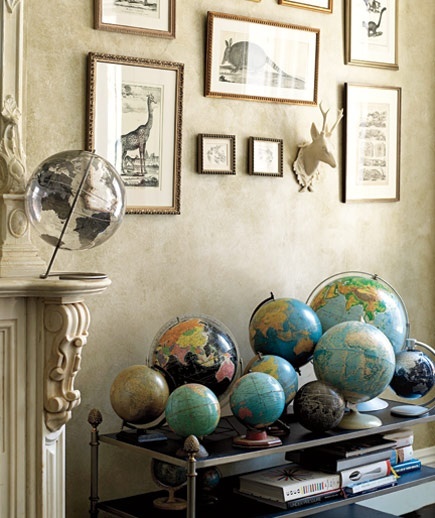 Vintage globe display by Casa Sugar. I have one old globe but am now inspired to collect more! A big grouping like this would be so much fun in an office. 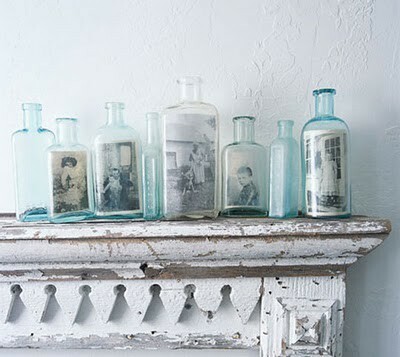 Displaying old photos in vintage bottles by Apartment Therapy. Finally, I am in love with this unique decorating idea! Vintage or other photos displayed in clear glass vintage bottles is such a cool way to show off and preserve the past. I love all of these! Thanks for posting. I absolutely fell in love with the vintage bottles with the vintage photos!! I have so many really old photos of family and want to distribute them around to other family members. PERFECT!!! So many fab ideas! I personally like to decorate with vintage cameras, and never use them, although I always wonder whether I’m being wasteful by doing so! Thankx for all these great ideas! 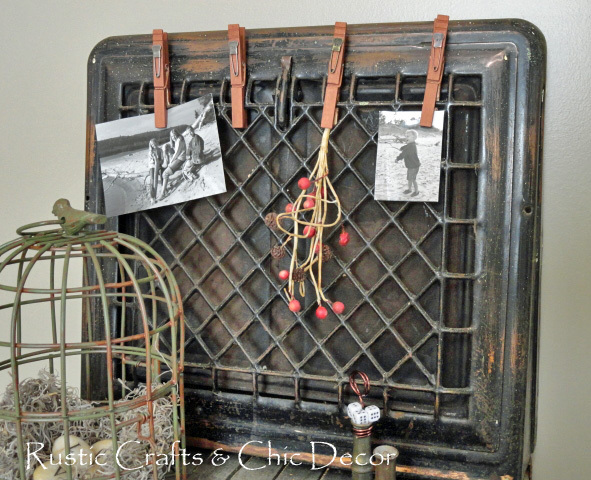 I love vintage and industrial, so combining the two is wonderful!